Source code in Python. Requires pytz. 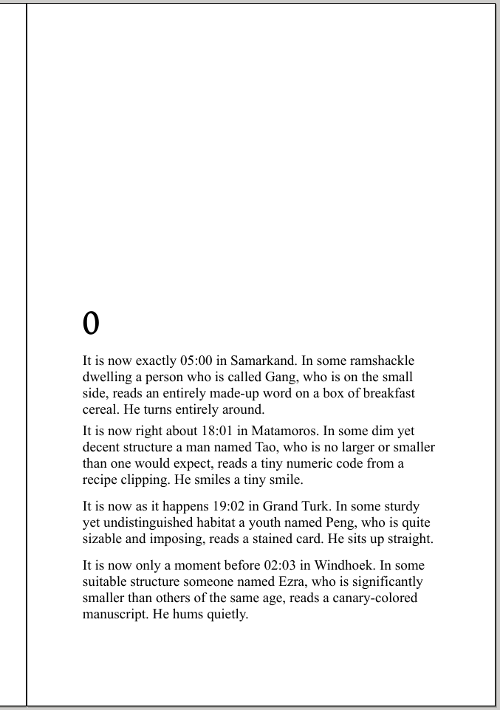 World Clock, the generated novel presented as a 246-page PDF. This is great. But I think I’ve caught a typo? Based on the time zone, I think that’s supposed to be St. John’s, Newfoundland, which has an apostrophe. Actually, it’s St. John’s, Antigua and Barbuda – which also has an apostrophe. So, you are right that the apostrophe needs to be added. I will amend the document to include it as soon as I can. Chris, thanks, I updated the version of world_clock.pdf to add the missing apostrophe and to change the font of the body text from Times New Roman to Gentium. The version of the novel that you have is now rare and precious. But certainly Gentium is a nicer font. Ah yes, Chris, it’s the tell-tale 30 minutes. St. John’s, Antigua and Barbuda is UTC-04:00, so you’re right, that must be the more northerly St. John’s. Sometimes Canada seems inscrutable, even without getting to its revocation of anti-prostitution laws, even without getting to Toronto. I appreciate the new-found understanding of time that you’ve offered. As I appreciate the new socio-temporal understanding that you’ve offered! It it intentional that the story takes place at winter (according to code exactly at 1-1-2000, according to text just in any period when DST is not used)? Good question — the new year is certainly significant, as a point when our appreciation of time is heightened. As for winter? Well, it’s only winter in the Northern Hemisphere.